1. Why do I have to manually put in all the configuration values in a DWC-400? The DWC-400 like most conventional controllers requires that the configuration be entered directly into the unit. The more powerful CD-4000 is able to remotely configure the digital weight indicator. 2. Why are all my orders over target weight? The trim limit switch is probably not working so that on the last draft, when the gate goes from the closed position to the trim position, it continues on to the full open position. 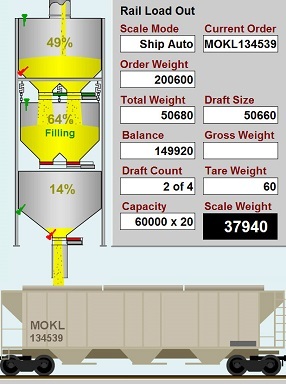 By this time too much product has entered the weigh hopper. Go into Buildup Mode and press the Trim soft key and make sure that the feed gate moves to the trim limit position and stops there, and does not move right out to the full open position. 3. I have gate control on my lower garner gate. Can I control this gate from the DWC-400? Unfortunately not. Only the CD-4000 and GMS-4000 have this capability. 4. Does the DWC-400 have any self learning parameters? The DWC-400 code is similar to the CD-3000 where the timing of gate closings is predetermined in Configuration. The system does not have any self learning parameters like the CD-4000.